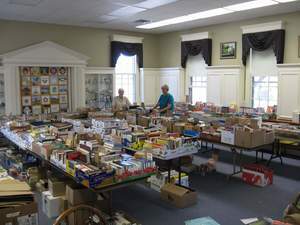 New Fairfield Library Book Sale Kicks Off Saturday! The Friends of the Library are holding their semi-annual book sale on Saturday, March 23rd to Monday, March 25th! On Saturday there is an early bird sale from 9-10am with a $10 fee to get first choice of the thousands of books available. Regular hours are from 10-4 each day. On Sunday come and buy a bag of books for $10. On Monday all books are free. Monetary donations are greatly appreciated. All proceeds from the book sale benefit the library. The Friends sponsor programs, buy equipment/furniture not funded by the town and support the library in other ways.